Today's quick but super smart tip was sent in by Sharon K. Mayhew. You're sure to know Sharon as she's been a longtime reader and commenter, but this is her first tip submission. Please visit her blog, Random Thoughts, and check out the peer critique fest she's been running this week as well as her other fantastic posts. Here's her tip! When I host a contest on my blog I write down the names and addresses of the winners in a writing contact address book. I also put down contacts that I have met at writing conferences in it. Keeping a separate address book for writing contacts will come in handy when you get that publishing deal you've been working so hard for. 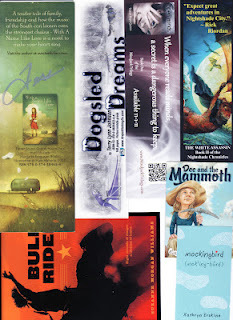 You'll have a quick source of like minded people that you can send postcards or bookmarks to when you have them made. Hopefully, they will be so pleased that you remembered them on your special day that they will rush out and buy your book. Thanks for that tip, Sharon - I like the idea of a notebook as we seem to keep everything online these days! Sharon, what a great idea. I wish I would have thought of that when I started my giveaways, but I'll start it right now. Because I'll have quite a few contacts to start out with that way. Thanks for sharing the tip. And everyone, you should check out Sharon's blog. It's great. Sharon is awesome and so is this tip!! Thank you! That's a great tip Sharon! Thanks! Great idea! I was just thinking this the other day - at some point I'm going to lose track. Not only the winners from my blog, but the other bloggers who have hosted giveaways that I won too. Question because I've held back from adding contacts to a writers list to then email when I have news. Isn't that kind of like spam? Unless you know them really well. Isn't that what a newsletter is for that they willingly sign up for. It's just that I've had bloggers start sending me monthly emails that I never asked for and I'm hesitant to do something like that to others. Unless they are close blogging buddies, that's different. What do you all think about this? This tip is just one more example of what an amazing networker Sharon is - I never think of things like that, but how handy that notebook would be! Laura, I'm talking about sending the people in my writing contact address book a bookmark or postcard via regular mail when you get a book deal, not spamming every contact I've ever made through email. My close blogging buddies would be the first to know if (when) I sell something. I can't imagine anyone being against getting a free bookmark in the mail. Great part to a marketing plan. You have a lot of this battle down. Congratulations. That is a wonderful tip - easy, practical, and sure to have many good returns. Thanks! This is a very good idea. At conferences, we often trade business cards. Having all those wonderful authors-to-be in one consolidated contact list makes for easy pickings when looking for writer buds to reach out to. That is brilliant! I'm such a fool to not have done this. Thanks for the tip! Great idea! 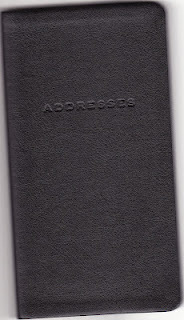 Now I get to run out and buy a little address book. Thanks! Just stopping in to wish you both Congratulations! I grabbed the WD May/June issue and see you're on the top 101 list! So very well deserved--you guys have a fantastic site here and a hugely valuable resource for writers! Great tip and I have seen how well this works. We know as writers we follow other writers, and well, crafters can follow crafters, and my wife is a crafter (scrapbooks and jewelry). When she buys something handcrafted online, she thinks it is so thoughtful when someone includes a little extra with her order - a handwritten note, a memento, or even a business card in the form of a bookmark. Every few months she receives a postcard from some of them and she eats it up, she loves it. She continues to do business with them because they took the time to stay in touch. Great tip! A little extra attention can go a long way! Great advice, Sharon! I hope that day comes soon for you.